Whatever you drive, whatever you want AHT Performance will have the solution. At AHT Performance our experienced and dedicated tuners have one endeavour, and that is to provide you with perfect performance package to meet your desired gains. You may be looking for a straight forward off the shelf ECU flash tune, a custom ECU tune, performance hardware, a performance engine build or a beef up to your driveline. Whatever you have in mind our performance team can accommodate, and we do it all in house. There are many tuning company’s in the market place and naturally they all claim to be the best at what they do. But buyer beware, many offer handsome performance gains and produce these results for a modest fee. With software tuning what you pay is very much what you get. Cheap tunes usually compile of a few changes to key parameters within the ECU map followed by switching off a suite of critical controlling modules to achieve their peak advertised performance targets. The result for you is the peak power/torque output is in a very narrow RPM range, more so a power spike. However, this practice is quite dangerous as there is a high risk of premature engine failure or at least reduced engine life because critical operating parameters have been deleted. Because this type of tuning requires a minimal time invested in mapping the tune software, the finished product can be passed onto the end tuner for a cheap price. **NOTE** the paragraph above is a very broad stroke explanation of poor tuning practices. AHT Performance has been very careful in the selection of the tuning companies we chose to represent, thus ensuring you, our client is presented with premium products from specialists in their field. Haltech – Provide range of new ECU units for custom tuning on our in-house hub dyno. This is an excellent option if you have an older model vehicle and there is no performance software support. A new Haltech ECU will provide our tuner with more than enough features and capabilities to create a tune map that will maximise your engine’s performance potential. Another excellent application of a Haltech system is for a carburettor to fuel injection conversion. This type of modification can transform you favourite classic into a much more enjoyable drive. BMW/ Mercedes – Several options are available for performance solutions and are rather model specific. Our tuners will recommend a particular company once we know your vehicle particulars. AHT Performance – Diesel Performance Upgrades – All diesel upgrades are custom tuned on our in-house hub dyno. Expect power and torque gains of between 25% – 30% depending on the condition of your engine and associated components. Prior to commencement of any performance upgrade our tuner will chat with you regarding what goals you are looking to achieve. You may be considering modifications to the intake or exhaust system and these should always be completed prior to your performance upgrade. Our preferred method for performance upgrade is custom tuning as this ensures the tune is perfect for the characteristics of your particular engine. Our tuner will perform a dyno run before and after tuning with performance figures recorded for both instances. The before and after figures are presented to you by way of a graph certificate which is testament to our tuner’s mastery in diesel performance upgrading. AHT Performance, a division of Andrews High Tech Automotive. 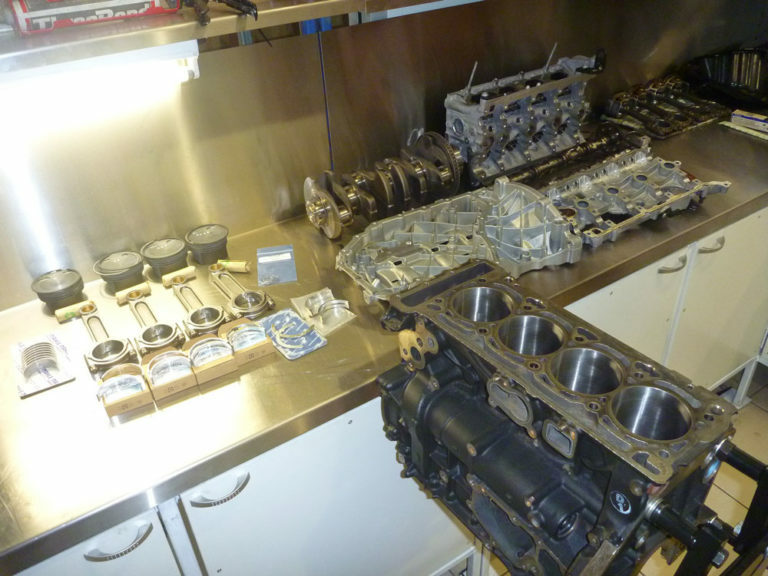 Pictured is an Audi engine having the pistons and con rods upgraded to a Mahle Forged assembly. This is in preparation for some serious performance enhancement to the vehicle.